October brings in 214,000 new jobs, and results in unemployment rate of 5.8 percent, the lowest in years, the U.S. Bureau of Labor Statistics reported. October showed continued improvement in both the unemployment rate (coming in at 5.8 percent) and the number of unemployed persons (9.0 million). Since January 2014, the unemployment rate and the number of unemployed persons have declined by 0.8 percentage point and 1.2 million, respectively. In October, the total number of long-term unemployed persons (those jobless for 27 weeks or more) remained stable at 2.9 million. These 2.9 million individuals accounted for 32.0 percent of the unemployed population. Over the past 12 months, the number of long-term unemployed has decreased significantly by 1.1 million. The civilian labor force participation rate was little changed at 62.8 percent in October and has remained flat over the past 7 months. The employment-population ratio increased to 59.2 percent in October. In October, 2.2 million persons were marginally attached to the labor force, similar to the figure reporting in October 2013. These individuals were currently not employed, but were able to work and had been in the job market for a significant part of the 12 months prior. 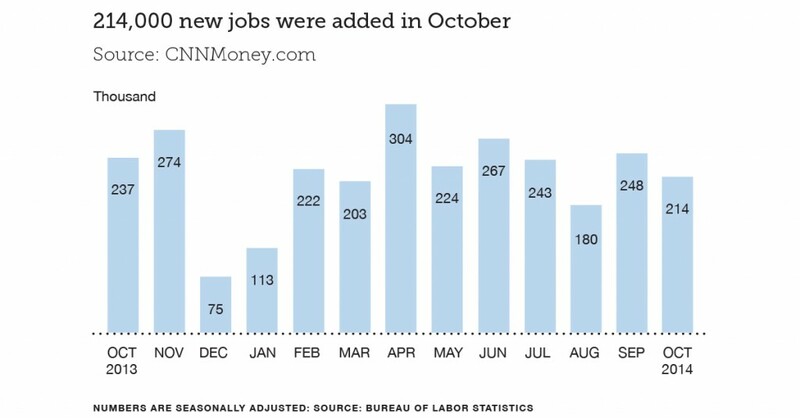 Since October 2013, an average of 56,000 jobs have been added per month. Since January 2014, jobs added in the professional and business services sector have grown by an average of 55,000 per month. The increase in finance jobs added to the economy has impacted economists’ predictions for salaries in 2015. To learn more about expectations for compensation in 2015, request your complimentary copy of the Parker + Lynch Salary Guide. Employment in other major industries, including mining and logging, wholesale trade, information, financial activities, and government remained stable, adding a consistent number of jobs month over month in 2014. In October, the average workweek for all employees on private nonfarm payrolls edged up by 0.1 hour to 34.6 hours. The manufacturing workweek was unchanged at 40.8 hours, and factory overtime edged down by 0.1 hour to 3.4 hours. The average workweek for production and nonsupervisory employees on private non-farm payrolls edged up by 0.1 hour to 33.8 hours.